THE Landholders Driving Change (LDC) Grazing Support Team will this year deliver four events targeting grazing fundamentals. The first of these – a Taking Stock – Pasture Management and Productivity Day – will be held in Collinsville on 21 March. 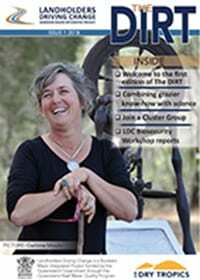 The workshop will be free to landholders in the BBB catchment, courtesy of LDC. Speakers will highlight the importance of forage availability when determining stocking rate, nutritional availability of different forages, new varieties and pasture rejuvenation techniques. Contact Senior Grazing Officer Brendan Smith (brendan.smith@nqdrytropics.com.au or 0417 408 587) to reserve your place. Dates for the remaining three events will be published when they are confirmed.